Good morning, Karen on the blog with you today. 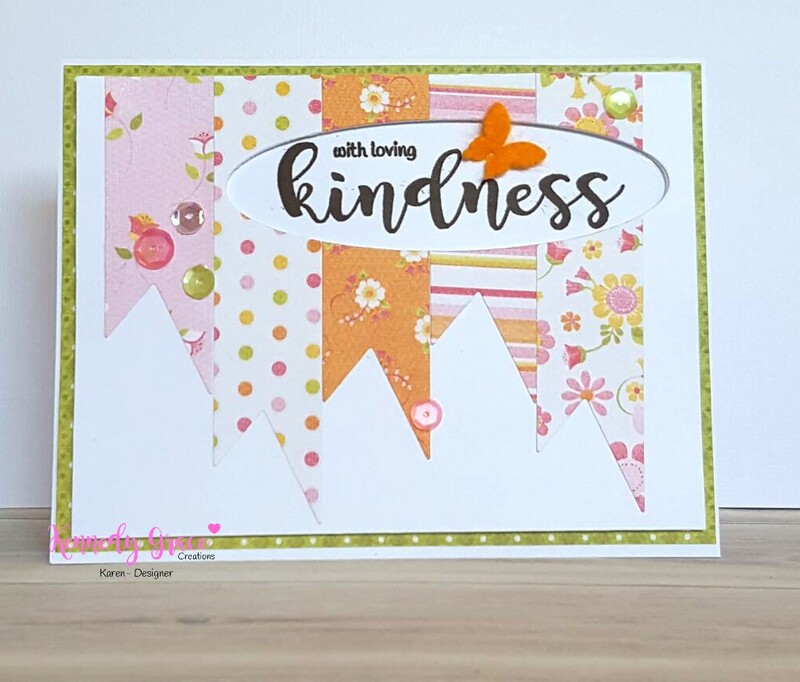 I'm sharing my card inspired by the February Mood Board. I took my inspiration from the colours. I chose my papers to showcase pink, orange and green as a colour scheme. I cut fish tail banners from my chosen papers and glued them in different lengths to my card stock. I then cut an oval sentiment and placed my sentiment in behind. The sentiment comes from the Kindness Medley Stamp set. I cut a duplicate from foam so the sentiment oval had some dimension and didn't sit flat. The little orange butterfly, cut from felt, was sitting on my desk, unused from another project, so I popped that on with sequins from the Primrose Mix. Last step was to put some green design paper behind. Its a beautiful Mood board so I hope you'll get some inspiration from it.